In my outrage since the election, I have been including people at my workplace when I distribute leaflets, etc., especally from Refuse Fascism. And a few of us took a lunch hour not long ago to watch and talk about the video of Bob Avakian from revcom.us, “BA Through the Years.” There was a definite recognition when BA talked about the prisoners in the Corcoran SHU being played, and I could tell some felt challenged by BA saying that the point is to get together and change all this, with revolution. Among the bigger mix of people there (white, Black, Latin American), there is definite upset about this regime, even while most still don’t see this fascism as the emergency that I do. This past Monday, Holocaust Remembrance Day, I brought stickers with “NO!” and “Never Again Means Never Again! 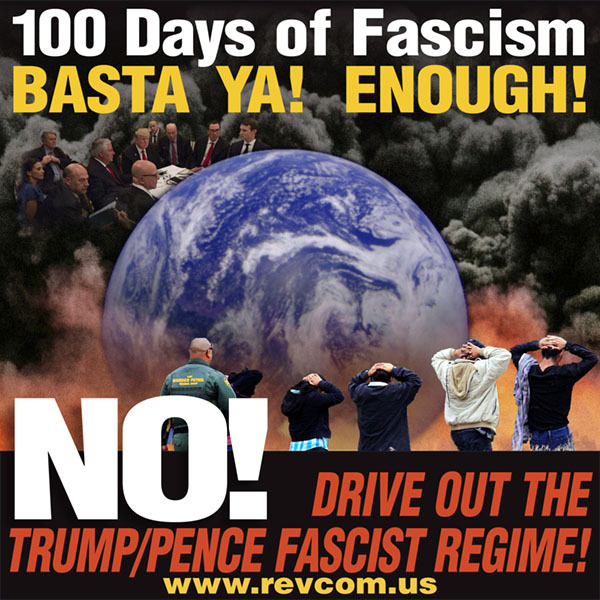 Drive Out the Fascist Trump/Pence Regime!” and invited people to join others everywhere and wear it for the day. 20 people (most of us) put it on, wearing it til the end of the day (I don’t know what they all did after work). Even people who have felt I’m “over the top” wore the sticker this day. We looked great! Now I’m going to spread around the revcom.us article about all that happened that day so everyone can see what they were part of. In our efforts to reach and move millions to act in this urgent moment, here was a form for people to act together and start to see a larger movement they are part of, and that could help them now take it further.